/ Guest post / Is your startup really worth 10 million euro? Is your startup really worth 10 million euro? A couple of weeks ago I was approached by an entrepreneur during a tech conference. He introduced me to his start-up and co-founder. He told me that they were seeking to raise up to €2.5 million at a €10 million valuation. The company generated a few hundred euros per week and had 3 FTEs. I challenged him by asking if he truly believes the company is worth €10 million and if he would pay as an investor €10 million for it today if he had, lets say, €50 million in his bank account? He told me he wouldn’t, yet at the same time he started arguing that all tech companies are crazy valued, good companies deserve high valuations and finished his speech by refering to several successful startups. I challenged him and asked him whether some of these companies might not be highly priced or overpriced? As some of you know there is a difference between price and value. Let’s apply the classic example of stock here. The price of stock is simply the number that a willing seller and a willing buyer reach that is agreeable to each party. Hence, the price is determined by the intersection of supply and demand. More buyers than sellers means the price of the stock will go up and the other way around. On the other hand, the value of stock today is based on the expectation of the future’s financial performance (read stock appreciation and dividends). According to the efficient market theory the price of stock is an unbiased estimate of the value of it. However, in reality this theory does often not apply, at least not to some of those ‘successful startups’ the entrepreneur was refering to. Today there are more than 130 ‘unicorns’. A unicorn is a private company that is valued in excess of $1 billion. Some say these valuations are entirely justified, others say it is a sign of another tech bubble. I argue that the vast majority is simply highly priced (or overpriced). In the sample below I look at (estimated) trading multiples (one of the several valuation methods) of six listed and six private technology companies (or unicorns). 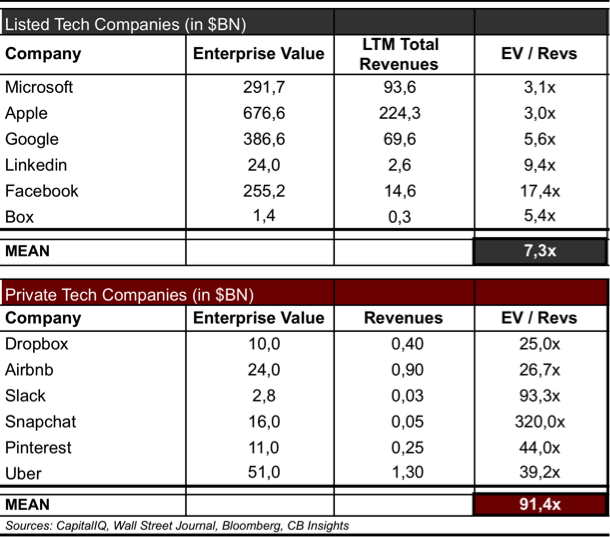 You can see in this sample that the average Enterprise Value / Revenue multiple is more than 10x (!) higher for these six unicorns, based on their last funding rounds*. If we take Snapchat out of the equation the average is still 6x higher. Looking at the table below, I can imagine that it also surprises you that Dropbox (private company) is valued at 25x revenues, whereas Box (public company) is valued at 5x revenues. A 20x difference for more or less similar companies with identical products. Yes, I do understand that these unicorns are expected to grow extremely fast, have various competitive advantages and will disrupt several markets. I do believe that some of them can justify a higher revenues multiple. But so many of them? Who can demonstrate a very limited operating history? I don’t they can. Fred Wilson once stated the following: “When private markets give you higher valuations than the public markets, it doesn’t make any sense”. I agree with him. Eventually these unicorns will (or at least want to) IPO and will also be valued in the public markets based on revenues and EBITDA multiples. I believe they will struggle to maintain their valuations. I believe some of these unicorns simply manage to find ‘more buyers than sellers’ at the moment. There is plenty of capital in the markets and there is also such thing as FOMO (‘Fear Of Missing Out’). One of my colleagues at Prime Ventures always mentions that the stock market is the only market where demand increases when prices go up. That seems to apply even more aggressively to the private stock markets, especially to companies at pre-IPO stage. Therefore, perhaps we should not talk about private company valuations anymore, but ‘the price investors have paid for the stock’. Maybe that makes more sense. The entrepreneurs I referred to in the beginning definitely would get a very hard time valuing their company at €10 million. But they would also struggle to find a buyer that is willing to purchase their stock for such a high price. I encouraged them to reconsider their valuation. At the end of the day, in this case, you can better hire five super clever software engineers that can build a similar product for €1.5 million and own 100% of the business. * Revenues of Airbnb, Slack, Snapchat and Uber are 2015 projections. 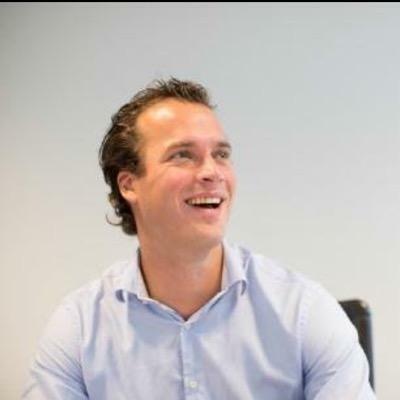 This guestblog is written by Pieter Welten, VC at Prime Ventures. This post originally appeared on VEECEE.co. What’s the difference between raising money and selling your house? Where do the numbers in venture deals come from? @Pieter Nice read. I guess the real problem is: who pays for the 5 super clever developers? My advice to most startups: There’s 24 hours in a day. If you are such a smart team why not earn money as employees or contractors first and bootstrap the whole idea? If your business generates significant revenue you can go for VC and give up your (part time) jobs. I am sure VC will value your bootstrapped revenues positively. Why? Because it shows you are capable of starting up a business with scarce resources.